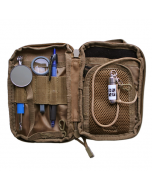 The Maxpedition TOTT Organizer may be perfect for Geocaching. It is Teflon protected, triple polyurethane coated, water resistant high tensile strength fabric. It features high strength zippers, paracord zipper pulls and double strength stress points. It gets a 6 on the 5 point scale. You're reviewing:Maxpedition TOTT Organizer - Khaki- Last Chance!! !